When executing a financial power of attorney, it is important to choose an agent you can trust and who has the competency to manage the financial tasks you assign him or her. The person should be dependable as well, and it would be more convenient if the agent lived near you. Agent must be at least eighteen (18) years of age. Within 30 days the completed and signed document must be filed with the clerk of superior court in the county which the agent resides. 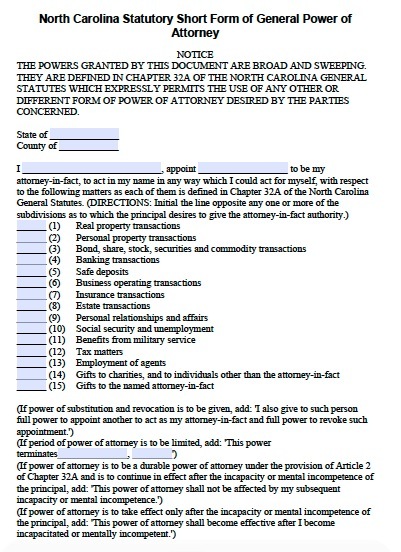 You can draft the agreement so it allows the agent to do all of these things, and so that the agreement only comes into effect if you become incapacitated (known as a “springing” power of attorney). This is an effective way to manage your estate in this unfortunate scenario. You can also authorize a small number of tasks for a limited period to plan for when you know in advance you will be absent from business.